Art for greeting cards should show a "me-to-you" situation and/or touch the heart and generate an "ah" response in the consumer. Some examples of art with a me-to-you response are shown and explained by agent Suzanne Cruise in her article "How to Keep Art Fresh & New: Reworking Old Art for Today's Greeting Card Market." *If the manufacturer already have contracts in place with one or several artists that has a certain type of style or subject matter and is successful, then they most likely will not be interested in licensing a another artist work that is similar. Of course, there is always exceptions because the manufacturer may need additional art in certain categories and/or they may deem that your art is different enough that it will not compete with their existing artists work and "dilute" the line. ** Having a set/collection of greeting cards that go together is not imperative but it sure gets the manufacturers attention when you do. Also, if you are fortunate to license a collection of cards to a manufacturer and the collection is placed in its own separate section of the rack it makes a bigger impact than if you license one design at a time and the card is mixed with other card styles. Note: Read Kate Haper's article "Greeting card submission guidelines - Artist & Writer Submission Guidelines for Greeting Card Companies" for a list of greeting card manufacturers and their guidelines. 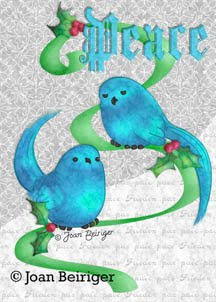 Also check out card design tips on Kate Harper's blog. Any information or comments that you would like to share about this article would be greatly appreciated. Click on the comment section below. Photoshop brushes are a great way to enhance your paintings and create interesting and varied backgrounds for your art collections and patterns. But why create your own custom brushes? Well maybe you can't find the effect that you'd like to achieve with the brushes already in Adobe Photoshop or the many brush tips available for purchasing or free on the internet. Or you may want an effect that is totally unique and not available to other artists. Or you just don't have the time to search for that special brush. Creating your own brush is as easy as painting or importing a black and white image onto a separate layer in Photoshop, select it, go to edit / define brush preset, name the brush, and press okay. However, you probably want to tweak the brush and select some of the many available dynamic options such as scattering, texture, and noise. And knowing which ones to select and experimenting with them can take time. Get some hints on how to create brushes and using brush dynamics by watching Ice Flow Studio's video "Photoshop: Custom Brushes and Brush Dynamics." Also look at fantasy artist Mike Lim's (Daarken) video "Painting Demo: Custom Brushes" to learn how to create brushes for wonderful backgrounds. Mike Lim's website also has a downloadable pdf file on step-by-step instructions for creating custom brushes. Go to his tutorial pull down menu and bring the cursor down and to the left to select custom brushes and click the mouse button. Note: Many of the sites having free brushes are listed in Kate Harper's blog in the resource section. Have fun creating your own custom brushes and if you have any suggestions or thoughts about this article please voice them in the below comment section. Exhibiting and walking the January Atlanta International Gift & Home Furnishing Market is an amazing experience. It is the largest gift show in the United States and has over 5000 permanent showrooms and another 5000 temporaries during the market. It is held at the AtlantasMart that consists of three buildings with 20 floors in building 1 (home accents), 18 floors in building 2 (gifts, garden, paper) and 13 floors in building 3 (apparel and jewelry). 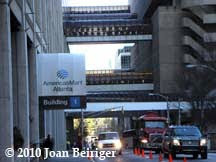 The buildings are connected by bridges on certain floors (see picture) so that once you are in the Mart you don't need to go outside. That was really handy for this show because it was bitterly cold in Atlanta and the streets were treacherous to walk. It snowed on the day before the show opened on Friday January 8 and the streets were very icy. Note: Taking photos inside the Mart is prohibited so the only ones I am showing are ones that the Mart gave me permission to show. The amount of buyers at this show was way up from last year. 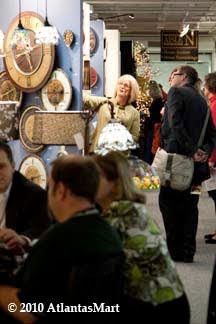 Read "AmericasMart Celebrates Robust Buying at Market, Positive Outlook for 2010 From All Buyers, Exhibitors." And during the show, the Mart and exhibitors really generate excitement with promotions, artist signings, demonstrations, and classes. Demdaco had more artist signings than they've ever had (nine). Scads of buyers were walking around wearing their make-and-take-it fabulously embellished high-design paper bag hats. And everyone stopped what they were doing, to watch and laugh as a wacky band of about 30 senior citizens with brightly colored clothing and makeup danced and paraded through the show. Artists can register for the show in several ways. 1. They can exhibit in the License and Design Collections. 2. They can attend free if they can meet the stringent registration requirements as a buyer. 3. They may be able to get on a manufacturers exhibitor list as a non-exhibiting manufacturer if they have a working relationship with that manufacturer. December 2011- Update on artists registering for the show. The Atlantas Mart has changed their policy starting with the January 2012 show. Artists can NO longer register by doing the following. • Ask to register because they are thinking of exhibiting at a future show and want to check the show out. In the past they needed a business card and pay $20. • Register by bringing a portfolio and business card to show that they were an artist. In the past they paid $20. Walking the show is a great way to check out the CURRENT trends. But it is easy to get sensory overload by walking the many floors of the Mart and looking at all the "eye candy" displayed in the floor to ceiling showroom windows. The colors and number of products are overwhelming. By the way, the windows are really the walls of the showrooms and you can see almost everything in the permanent showrooms from the corridors. At this show it was obvious that coastal themes are popular because it seemed that every gift showroom had coastal products. Snowmen and Santa are still popular icons for Christmas. Dark red and green colors seem to be used mainly for traditional and more realistic Christmas themes but there was plenty of the chartreuse green and bright red used in the more whimsical themes. Blue and white were also used on Christmas products. The success of exhibiting in License & Design Collection section of the show was a mixed bag. The show is still new (second year) and not all the manufacturers are aware that the Licensing section exists. And some of those that did know about it, could not find it because it is held on a hard to find floor. It also didn't help that there was an error in the show guide that listed the Licensing section in the wrong building. Another draw back this year was the enormous amount of buyers that attended the show. And they were buying! Thus, art directors that normally could have broken away from the showrooms to look at art in the Licensing section were needed to help write up orders. As a result, the traffic of art directors through the Licensing section was slim. Still this was a successful show for the artists and agents that already have established relationships with manufacturers and those that made appointments. Also the pre-show reception (manufacturer meet the artists/agents) the night before the show opened was a success because some manufacturers did come and view the art. Note: Many of the exhibitors I talked to said that this show is still new and even though the traffic this year wasn't the best they are optimistic that as the show grows the traffic will improve. Wow! Artists now have a choice in choosing from three different mock-up template packages to help them create product mock-ups to showcase their art to manufacturers. All three packages are different and the artist biggest challenge will be in deciding which package(s) to purchase. Phyllis Dobbs has introduced "Create Product Mockups." It is a mock-up package of 93 templates for a wide variety of popular licensed products categories with free updates as more mock-ups are added. The templates were created with vector lines in Adobe Illustrator and can be used in Adobe Photoshop, Adobe Photoshop Elements, and Adobe Illustrator. Note: Illustrator artists may be especially interested in this package because it includes drawings of the mock-ups not only in Photoshop file format but also Illustrator file format. See the description of the other two product mock-up packages in "Templates for Product Mockups - 2 Great Packages Now Available." Wow! Artist Tara Reed made a free video on how to use Photoshops contact sheet plug-in for making portfolio and tearsheet pages after she heard about it from art licensing agent Suzanne Cruise during December's Ask Suzanne Cruise teleconference. What is wonderful about this plug-in is that it automatically creates layouts of art files without having to open all the files and reformat them to fit the page. Tara's video "Photoshop Tips - Using Contact Sheets II to create art portfolios and tear sheets" has been uploaded to youtube and written instructions on how to use Contact Sheet II is on the Adobe website. 1. Create pages of art for your portfolio. 2. Create comp sheets / sell sheets / tearsheets to send to manufacturers. 3. Create pages of art when filing art collections to be copyrighted by the Library of Congress. 4. Creating pages of art to catalog and keep track of your collections. Note: The "Contact Sheet II" plug-in is already included in Photoshop CS3 but must be downloaded from Adobe for CS4 (Macintosh and Windows). I could not find internet articles about product trends for social expressions and the gift industry but there are trend articles available for other industries such as fabric, food, fashion, scrapbooking, wedding, and home remodeling. And those are the ones you should look at anyway. To predict future trends in industries you want to license your art, you need to look at trends outside those industries (where trends come from) and also at lifestyles which greatly influence them. Many popular colors for gifts and greeting cards initially come from the fashion industry. The colors then trickle down to crafts, home decor, social expressions, and gifts. Therefore, knowing what colors will become popular years in advance helps you plan your art so that it is trend ready. Read what colors Pantone Color Institute thinks will be popular this spring for the fashion industry in "Color Trends: PANTONE Fashion Color Report Spring 2010 Splashes of Sunshine for Spring 2010." The same thing applies to products. For instance, some artists took advantage of the prediction that the lifestyle trend for green products would be big and created art before "green" became really popular. 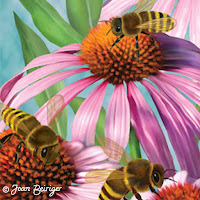 As an example, artist Tara Reed signed a contract with a manufacturer for a 2010 calendar called "Make this a Green Year." She finished and delivered the art a year before it was published last July. Now that is planning ahead and taking advantage of a future trend! Caution! The prediction of trends can be fickle and some artists have found that manufacturers do not necessarily want what trend experts believe will be the latest trend. Read "An Editorial on Color Trends." Also trend predictions are not infallible. Some are correct and others not. Below are links to trend articles that may give you ideas for creating trend forward art. What was selling at the 2009 summer CHA show. Even though this is not a prediction for 2010, it is still informative to know what was selling in 2009 and may still be popular beyond 2009. "Top Product Trends from CHA-Summer 2009 - Scrapbook trends of 2009"
Green trends for home remodeling. "Green Product Trends"
2010 trend design prediction published in 2008. Were they correct? You make the decision. "Spring/Summer 2010 Trend Inspiration From Mudpie's Latest Trendbooks"
Fabric Trend magazine. "Fabric Trends for Quilters"
Fashion trends. "CIFF Trends - Fashion Trends Autumn/Winter 2010-2011"
What restaurant diners will look for in 2010. "2010 Product Preview: What's Next? " Food trends in Europe. "Top Ten EC New Product Trends"